The Buddha statue found by the girl. An 11-year-old girl, R.H.M. 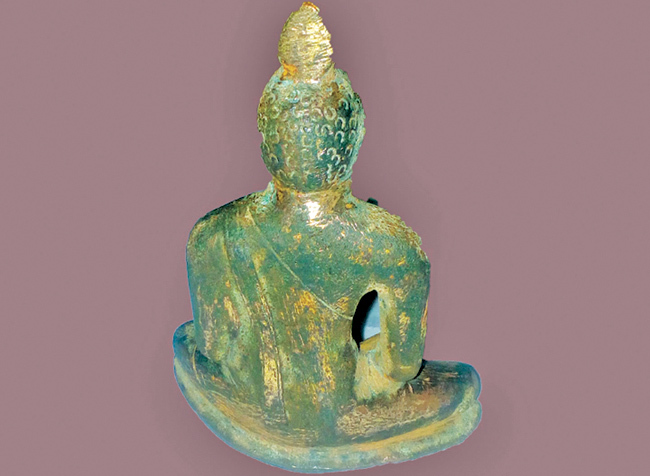 Navodiya of Rajkavigama, Karuwalagaswewa, had found a miniature gilded Buddha statue in a flower bed in their garden on February 27. The statue, about 4 inches tall and weighing 500 g, was later taken over by her mother. Villagers who came to know about the rare find, had informed Grama Niladhari of Rajavigama and the Karuwalagaswewa police. The Grama Niladhari had later taken charge of the statue and handed it over to the Karuwalagaswewa police. Police said there was no proof that it belonged to a hidden treasure. Archaeological authorities will be informed about the statue, they said.